Although I was living in Yellowknife for work, the city didn’t work for me. I was drowning there. My alcohol abuse landed me in and out of jail, and I reached a point where I said to myself, “Dave, you’ve gotta go, this city’s killing you.” So I left. I hoped moving to Edmonton would give me a new start after the hard times I’d faced up north. I didn’t own much, but I kept my few possessions in garbage bags and carried them with me. You don’t know what it means to struggle for survival until you’ve carried everything you own in garbage bags. I got to know other characters on the Edmonton streets. It can be rough and you can’t believe or trust everyone, but I consider many of them family and friends I can trust—good people who fell on hard times. I went to Bissell Centre pretty quickly after coming to Edmonton, and eventually it became the closest thing that I had to a home. They’ve got staff who really care about you—they became my good friends too. Bissell Centre staff connected me with an addictions and mental health worker. They also assigned a housing worker to help find me a place. I was homeless in Edmonton for about 10 years before I was ready to look for housing. Through the Homeless to Homes program at Bissell Centre, I have a home of my own, after 10 years on the street—10 years without a place that’s warm, safe, and mine. I had lots of friends on the street, but I wouldn’t share with anyone where I was living because I didn’t want anything to happen that might encourage old habits. I’ve worked hard to recover from alcohol addiction and I’m proud to say that I’m 18 months sober! I’ve worked hard to recover from alcohol addiction and I’m proud to say that I’m 18 months sober! In May of 2018, I was at home by myself and something happened to my sight. Everything looked distorted and blurry. My right side felt numb and weak. I couldn’t walk and I slumped to the floor. It was two days before a neighbour found me and called 911. I didn’t think I would make it. But thanks to my neighbour, the paramedics came and took me to the hospital where they told me that I’d had a stroke. Somehow, Bissell Centre staff learned that I was missing and found me in the hospital. While I was in the Glenrose Hospital, they worked with my landlord to find me a new apartment—my old place was on the third floor and would’ve been impossible for me to access. The new apartment that they found for me is in a building with an elevator, so I can get into my home. Bissell Centre’s staff have gone above and beyond for me. They do a whole bunch for me. They’re currently helping me to get into a lodge that can help me with my rehabilitation. I am grateful to Bissell Centre and to the people who give to them and make their work possible. They’re doing good work in our city—I wish more people knew about Bissell Centre and what they do. They got to know me and they’re still helping me where I’m at today. Without the help of the Bissell Centre, I would have died on the street. I had nothing, and now I have everything. 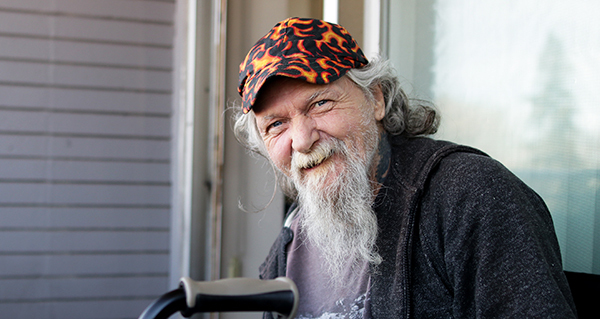 Donations from the community help people like Dave find a fresh start in life, feel loved and cared for, and build important connections with others. Please consider providing essential, life-changing services to people in need this Easter season.